Let’s get it out of the way. In June, Spanish police raided the hotel where world record holder and defending world champion Genzebe Dibaba was staying along with a host of athletes coached by Jama Aden. They allegedly found EPO and doping materials. Aden, who coaches Dibaba, and a physical therapist were arrested. Many track fans are doing the math: Dibaba has run ridiculous times under Aden, including breaking what many believed to be an unbreakable world record last summer. Though Dibaba has not been found guilty of anything, there will always be questions about her. That being said, Aden has vehemently denied the charges in an exclusive interview with Paul Gains. Aden said he’s never doped an athlete and said that only “magnesium and calcium and vitamins” were found in his own room. 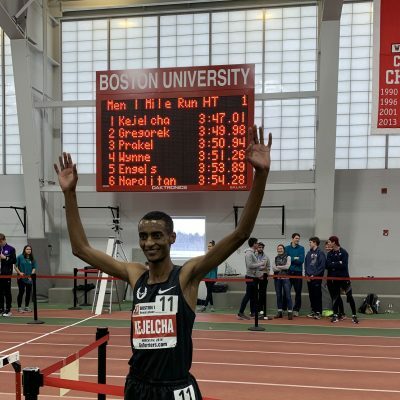 He said that the EPO was found in the room that his 800 runner Musaeb Abdulrahman Balla shared with a runner from Yemen and they don’t know who the EPO belonged to. He said the physio didn’t work for him but for the Saudi Arabian team. Per the AP, 28 of the 30 athletes staying at the hotel at the time were drug tested by the IAAF and common sense indicates that all of the tests came back negative as the raid happened more than seven weeks ago and not a single athlete or coach has been sanctioned by WADA or the IAAF (Balla is entered in the 800). Additionally, while Aden was arrested, we don’t believe he was ever charged with a specific crime. Since Dibaba has not tested positive (she was tested right after the raid) and there is no evidence that implicates her directly, she is eligible to compete. 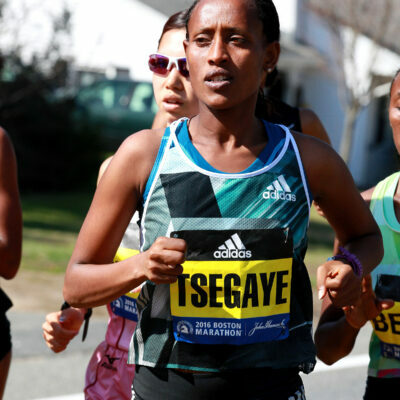 Ethiopia picked her for their team, so she will be in Rio. The presence of Dibaba casts doubt over an event that four years ago was one of the dirtiest in the entire Olympic Games. The good news is that the dirty Russians and Turks from 2012 aren’t entered. Neither is Sweden’s 2013 world champ Abeba Aregawi, who tested positive for meldonium earlier this year (she was eligible to compete but Sweden did not select her). On a positive front, the field does contain eight of the top nine from last year’s World Champs in Beijing, including Kenyan record holder Faith Kipyegon, World Indoor champ Sifan Hassan, British record holder Laura Muir, American record holder Shannon Rowbury and three-time defending U.S. champ Jenny Simpson. We dive into the event below. Who’s the Favorite: Dibaba or Kipyegon? Even before the police raided Dibaba’s hotel, there were questions about the fitness of Dibaba. She was scheduled to run a 10,000 in Dubai in April but pulled out with a toe injury, according to Aden. That was the same excuse when Dibaba withdrew from the Prefontaine Classic a month later. Dibaba finally ran a 5,000 on June 30 in Barcelona — her first race since claiming the World Indoor 3,000 title three months earlier — but dropped out and exited the track on a wheelchair after coming through 3,000 meters in 8:41. 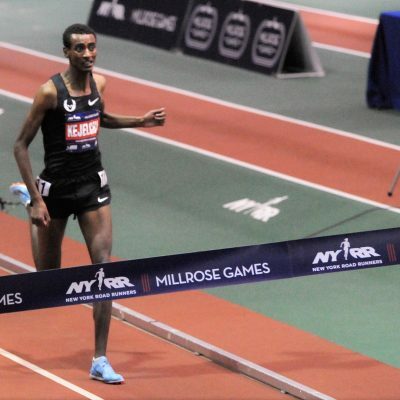 That’s becoming a trend among Aden’s athletes — Dibaba had to be carted off after failing to advance from her prelim at the 2012 Olympics and Ayanleh Souleiman exited the track in a wheelchair after the 2016 World Indoor 1500 final (he also DNF’d his 1500 prelim at Worlds last year). Independently, those incidents are a little out-of-the-ordinary but not unheard of. Taken together, they form a pattern of strange behavior that begs the question: why does this keep happening to Aden’s top athletes? Dibaba has only finished one race this year outdoors — an admittedly impressive solo 3:59 1500 victory on July 9 — which doesn’t give us much to go on. Are we getting the Dibaba of 2015, or even the Dibaba of the 2016 indoor season, where she broke the indoor mile world record (4:13) and won World Indoor gold? If so, no woman on Earth can stop her in Rio. 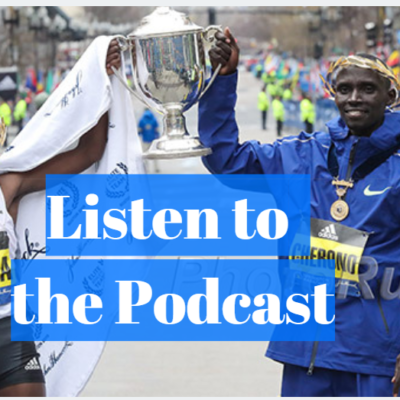 But if Dibaba really was hurt earlier this year, she could be beatable, not least because two women are in terrific form: Faith Kipyegon and Laura Muir. Kipyegon was the silver medallist in Beijing last year (in case you forgot, she closed her last 800 in 1:57.6) and has been even better so far in 2016. She broke the Kenyan record in her first race of the season (3:56.82 in Shanghai on May 14), then broke it again two weeks later at Pre (3:56.41). Then she won the mile in Oslo and, most recently, crushed the competition at the Kenyan Olympic Trials. Muir hasn’t been as dominant as Kipyegon — she was only fifth in Stockholm on June 16 — but she’s the only woman who’s finished remotely close to Kipyegon this year (running 4:19.12 to her 4:18.60 in Oslo) and is coming off the best run of her life, a front-running 3:57 British record in London on July 22, where she destroyed World Indoor champ Sifan Hassan over the final lap. 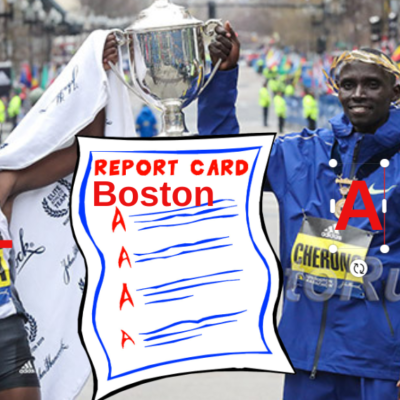 You could make an argument that Kipyegon deserves to be the favorite. Unlike Dibaba, there’s no uncertainty about her health and her coach hasn’t been arrested in a drug investigation. Remember, she was second in 2015, and though Dibaba’s .87 margin of victory was large, Dibaba is almost certainly not as good as she was last year when she broke the WR and Kipyegon is better than she was last year. But saying Dibaba isn’t as good as she was last year is kind of like saying Barry Bonds‘ 2002 season (where he hit 46 home runs and won NL MVP) wasn’t as good as his 2001 season (where he hit 73 home runs and won NL MVP). Yeah, Dibaba might not have put together one of the greatest seasons ever like she did in 2015, but she was still amazing this year indoors (her 4:13 mile WR is worth about 3:54 for 1500). If you run 3:50, crush everyone at Worlds and keep crushing everyone indoors, you’re the Olympic favorite even if you only race once outdoors. Even if you’re not willing to grant her gold, Kipyegon appears to be a lock for a medal. She can handle any kind of race, with speed to burn (that 1:57 close last year) and strength in reserve (14:31 5k pb). Dibaba will likely earn another, but there’s obviously some uncertainty about her position. There are several women who could battle for the other medal(s). Chief among them is Muir — we already told you how fit she is, and she’s no stranger to big races, taking 5th at Worlds last year and winning a DL event in each of the past two years. After cruising to victory at World Indoors, we would have said Sifan Hassan had a medal wrapped up but a hamstring injury kept her from racing outdoors until July 8. 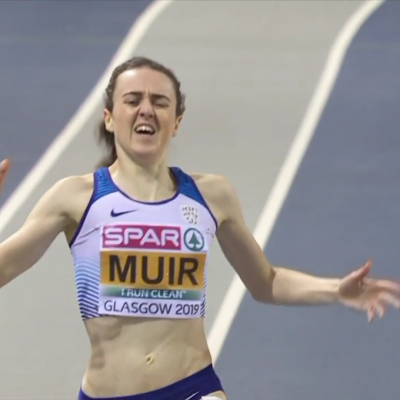 Though she earned a silver at the European Champs and was second to Muir in the London Diamond League, she’s not the 3:56 runner she was a year ago. A medal is possible, but not probable. Dawit Seyaum, who took silver to Hassan’s gold in Portland in March, has a better shot in Rio. She’s succeeded at every level — World Youth silver in 2013, World Junior gold in 2014 — and has found success in the pro ranks recently with her silver in Portland and 4th at Worlds last year. She was third behind Kipyegon in Shanghai (Hellen Obiri, who is only running the 5k in Rio, was second) and second behind Kipyegon at Pre, running 3:59.87 in the former race and 3:58.10 (#3 in the world this year) in the latter. The concern about Seyaum is that she was only eighth in her last race in Stockholm on June 16 — by the time she runs in Rio, two and a half months will have elapsed after her last good race. 28-year-old Angelika Cichocka of Poland has also emerged as one of the women to beat. Eighth last year in Beijing, the Pole has broken out in 2016 thanks to her devastating kick. 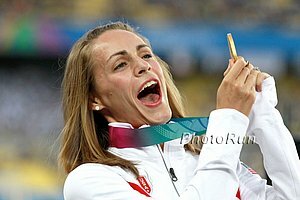 She surprised by taking the win at the Stockholm DL but showed that was no fluke, outkicking Hassan in a tactical 1500 final at the European Champs and clocking an 800 pb of 1:58.97 in Monaco on July 15. 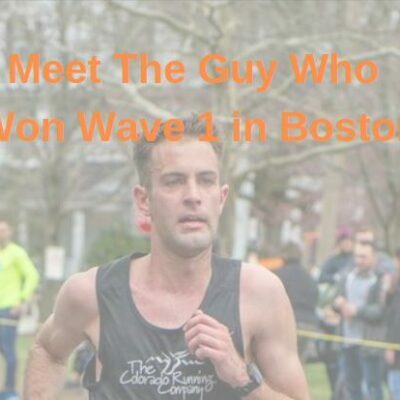 Can an American Medal in This Event For the First Time Ever? The U.S. has never won an Olympic medal in the women’s 1500, perhaps because the list of Olympic medallists in the event could easily be retitled “List of Women Suspected or Convicted of Using Performance-Enhancing Drugs.” Although if we are being totally objective, it’s not fair to give the US a pass on the doping front as past US 1500 Olympians Regina Jacobs and Mary Slaney both served doping bans themselves themselves and 2016 Olympian Shannon Rowbury is part of Alberto Salazar‘s Nike Oregon Project which has been accused of doping violations. But with Rowbury, Jenny Simpson,and Brenda Martinez, three women who have won World Championship medals, the U.S. has never sent a stronger squad to the Olympics (Simpson, Rowbury and Morgan Uceny in 2012 was strong, but Simpson and Rowbury are both better than they were four years ago). Martinez, who was a distant third at the Olympic Trials, is a long shot at a medal (though her chances are still better than they would have been in the hyperandrogenism-dominated 800) but both Simpson and Rowbury are realistic threats. Actually getting on the podium will still be very difficult, however. Kipyegon smoked Simpson in both of their matchups this season (Shanghai and Pre, where Simpson ran 4:04 and 4:01) and did the same at Worlds last year. So did Seyaum. Simpson has a lot going for her — she is experienced, with two World Championship medals, and looked as strong as ever in winning USAs — but the gulf between her and the top women in the world was large two months ago. We’re sure Simpson has narrowed it, but will that be enough? Rowbury enjoyed a terrific indoor season capped by 3k bronze in Portland, and though she took a little while to get going outdoors (she trained through Oxy and was only 10th at Pre), her last two races have gone very well as she was second at the Trials behind Simpson before running an 800 pb of 1:59.97 in Eugene on July 29. That last one is instructive as it shows Rowbury’s speed is better than ever at age 31. Though the 1500 was a backup plan for Martinez, she was actually 5th in this event at World Indoors and beat Rowbury over the same distance at Pre (she also just nipped Rowbury in the race where Rowbury set her 800 PR). And though Martinez runs more miles and longer, faster tempos than almost any female 800 runner (and many 1500 runners too, we’d bet) she’s just not as strong at 1500 as Simpson and Rowbury. 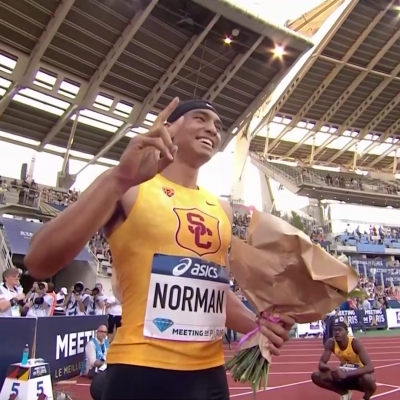 The Trials result is Exhibit A; Exhibit B is her 4:00.94 pb. Martinez is good enough to make the final, but she barely made it onto the U.S. team. Not many people do that and go on to medal at the Olympics. The biggest problem facing all three Americans is that the top women are simply faster than they are. Rowbury was in the shape of her life last summer and ran the American record in her last race before the 2015 Worlds. Yet she was only 7th in Beijing. Did Rowbury peak a shade too early? Perhaps, but to medal at Worlds last year, you had to close in 1:57.6 or faster for the last 800. That’s not something that Simpson (who lost her shoe in the final in Beijing) or Rowbury has ever shown themselves capable of doing. Simpson did manage to win Worlds in 2011 without breaking 4:03 the entire year, but this field is MUCH stronger than that one. For one of the Americans to medal, some of the favorites will have to run poorly. Assuming Dibaba is healthy and runs it, she should win this race. 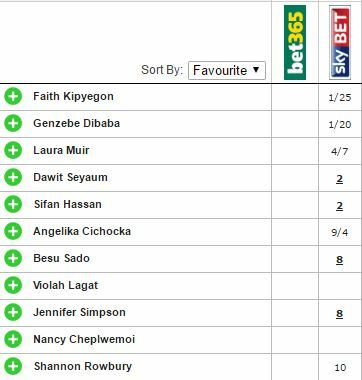 If she’s not 100%, we’re going with Kipyegon, who has been the best in the world this year outdoors by a comfortable margin. Muir broke Kelly Holmes‘ British record in her last race and we like her to become the first Brit to medal in this event at the Olympics since Holmes in 2004. 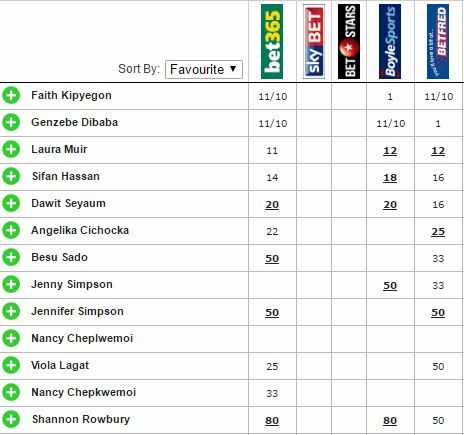 Betting Pick: The bookies in the UK have nailed this one pretty well as they like us realize that Dibaba or Kipyegon should be the winner. Here are the odds to win. That being said, it might be fun to put down a few pounds at 50 to 1 for Jenny Simpson. If there was a fall or bout of food poisoning that knocked out Kipyegon/Dibaba, she’s got a good shot. In terms of changes, to medal, you can get Jenny Simpson at 8 to 1 which seems like a decent bet as she normally peaks well. 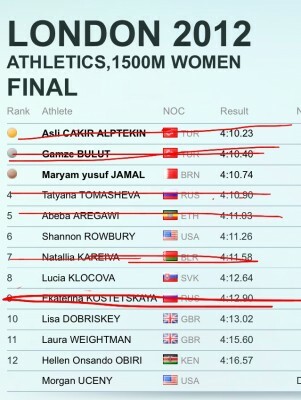 We certainly think that is a much better value proposition than Laura Muir at 4/7. Vote in the poll below and talk about the race on our world famous fan forum / message board: MB: 2016 Olympic W 1,500 Preview: Can An American medal for the 1st time ever? 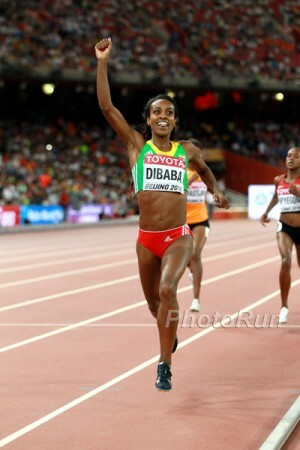 Will WR holder Genzebe DIbaba win gold? Who will win the women's 1500 in Rio? Will an American medal in the women's 1500 in Rio?